The port south of San Francisco is also looking at a potential future ferry service. The port is the southernmost cargo seaport on the San Francisco Bay. The Port of Redwood City is gearing up to take on what regional leaders hope will be an expanding role in cargo shipping and water transportation on the Peninsula and in Silicon Valley. With a $16 million renovation project set to begin this summer and talks under way on a future ferry terminal, port and city officials say the port's future is bright. Located about 18 nautical miles south of San Francisco, the Port of Redwood City -- the southernmost cargo seaport on the San Francisco Bay -- is uniquely positioned to contribute to the development of waterborne commerce in the region, Redwood City community development director Bill Ekern said. "They aren't building any new ports," Ekern said in a recent interview. "I hate to use so many metaphors, but we think it's a fantastic anchor to use for business development in the area." When the port first started operating during the height of the Gold Rush in 1851, it was primarily used to transport timber from the Peninsula to lumber mills in San Francisco. Since then, the port has grown into a major supply point for the region's construction industry and a busy point of export for scrap and recycled metals, port executive director Mike Giari said. The demand for recycled metal in the Far East helped fuel a 3.5 percent increase in exporting metals in fiscal year 2010-11, which amounted to a record high of more than 871,000 metric tons, Giari said. Sims Metal Management, an international metals recycler that operates a facility at the port, recycled more than 300,000 scrapped vehicles last year and shipped the broken-down metals directly out of Redwood City, Giari said. 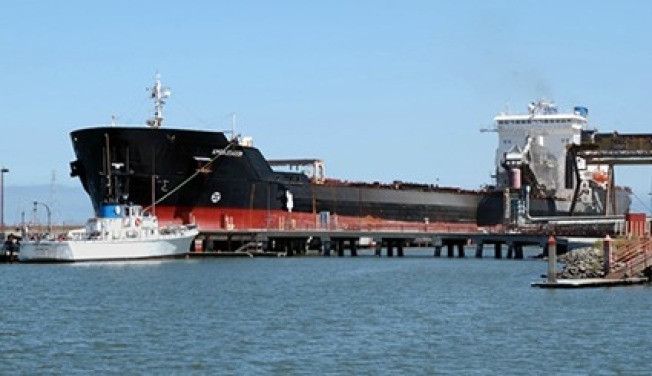 More than 420,000 metric tons of construction materials -- such as Mexican gypsum used to make wallboards and Australian bauxite used to make cement -- were unloaded at the docks in fiscal year 2010-11, Giari said. "Certainly the good news with those materials is that they're the same as the year before," Giari said. "All of those materials are driven by construction activity," he said. A $16 million project to upgrade the port's main terminal will break ground next summer, expanding the port's capacity, Giari said. At present, the port's dock can only accommodate one ship at a time. The Wharves 1 and 2 Improvement Project, which has already passed an environmental review, will replace a 60-year-old wooden dock with a reinforced concrete structure that can accommodate two cargo ships at a time. "It expands the port's capacity," Giari said. "With the new configuration, we'll be able to have two ships call at the same time, rather than just one." The renovation is expected to create scores of much-needed construction jobs, Giari said. Aside from its continued commercial importance, the Port of Redwood City is poised to become an important player in the region's transportation network by taking advantage of its access to the Bay and proximity to U.S. Highway 101. Port officials are working with the San Francisco Bay Area Water Emergency Transportation Authority to identify potential sites for a ferry terminal on port-owned land, with the ultimate goal of establishing high-speed commuter ferry service from Redwood City to San Francisco and the East Bay. WETA hopes to put into service two catamaran ferries that would take 149 passengers per trip to San Francisco's Ferry Building in about 45 minutes. The ferry service is still in its initial planning phases -- an environmental review won't be completed for at least another two years, Giari said. With the ferry and renovation projects in the works, port and city officials are confident that Redwood City's port will play a crucial role in the region's industrial and economic development. "As commerce evolves over time, it will continue to open up other opportunities," Ekern said. "From the city's perspective, it remains an incredibly valuable asset," he said.